World leader in online poker, Poker Stars found itself shut out of the legal U.S. poker market this year, after one debacle after another. First the settlement with the U.S. DOJ, then a 5-year bad-actor clause keeping Poker Stars out of Nevada, then the Atlantic Club rescinded on a deal with the site with no time for PokerStars to form a new deal in time to get one of those few coveted licenses to operate in New Jersey, then an ugly legal battle, followed by a new deal with Resorts Casino that was then thwarted when the New Jersey Division of Gaming Enforcement suspended PokerStars’ application for foreseeable future. And Delaware is doing its own thing. Which leaves PS in the US, SOL. 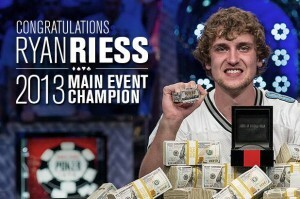 American player Ryan Riess becomes the first player born in the 1990s to take down the World Series of Poker Main event, for an over $8 million takeaway, with poker pro Jay Farber taking the $5+ million runner-up prize. The World Series of Poker launched its WSOP Asia-Pacific, with its first ever stop on the tour taking place in Melbourne, Australia where, among the 11 days of events, was a $2,200 Mixed Event that Phil Ivey won. Billionaire sourpuss Sheldon Adelson came out in force against legalization of online poker, publicly calling for a federal ban on the activity, a call that seems to be getting scant little takers. Poker legend Doyle Brunson turned 80 years old on August 10 of this year, and just a month after landing his 35th in the money finish in a World Series of Poker event. Happy Birthday indeed, Texas Dolly.